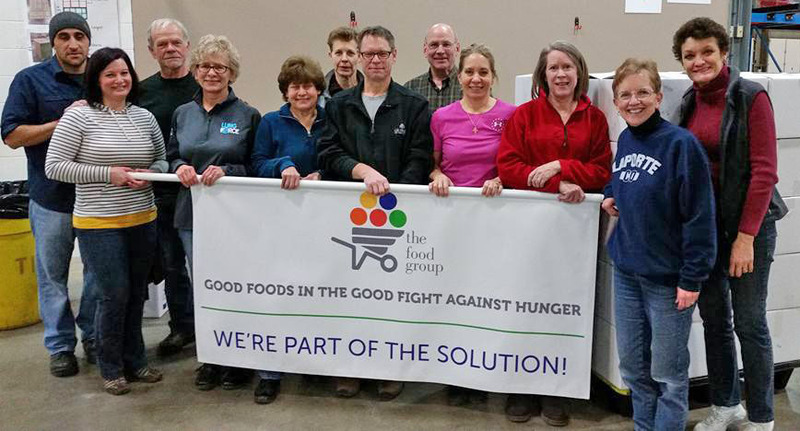 At our December 2018 Holiday party Twin Cities Soroptimists collected donations for the Rosemount Family Resource Center. The Center serves often ignored communities, low income families in the suburbs, who are especially vulnerable in the cold of winter. We collected and donated a total of: 2 winter jackets, 44 winter hats, 38 pairs of mittens, 2 winter scarves, 10 t-shirts, a dozen bottles of shampoo and conditioner, 20 tubes of toothpaste, 5 bottles of baby wash and wipes, 15 bars of soap, 35 tooth brushes, and feminine hygiene products. 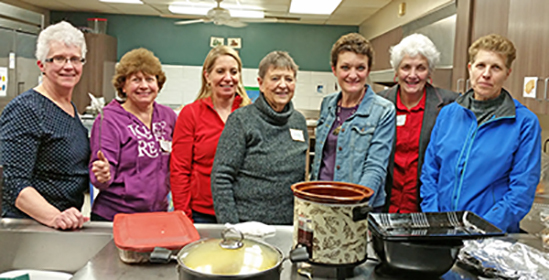 Each year Twin Cities Soroptimists serve dinner and provide career networking/guidance for the 2 dozen residents at Sarah's an Oasis for women (a home for international female refugees and asylum seekers). We also provide welcome bags for all new residents at Sarah's throughout the year. 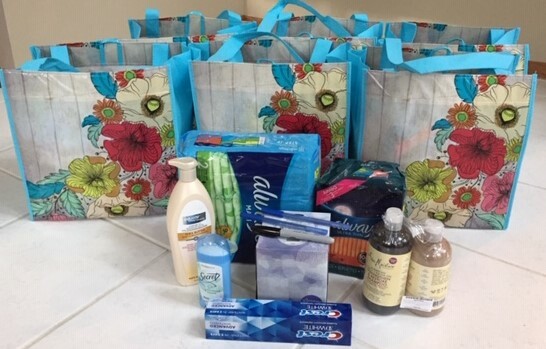 The bags include culturally-specific hair and body care, plus other hygiene products, along with a welcoming message in a new bag all their own. Additionally, we send each resident a birthday card and gift card throughout the year, as many women have no family or even contacts in the community and we want to ensure that none are ever forgotten on their birthday. 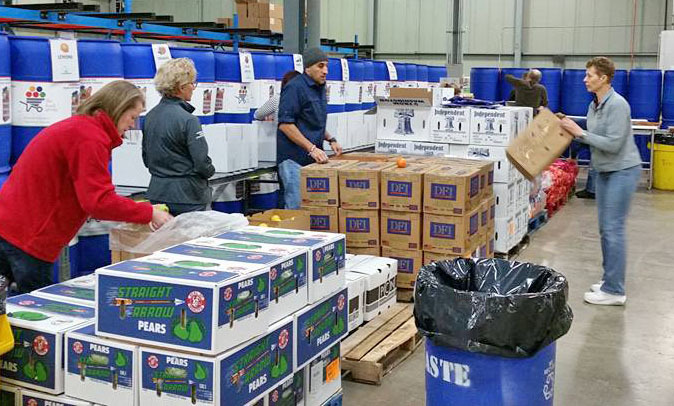 The Twin Cities Soroptimist Club members came out in force to pack boxes of fruit and vegetables for The Food Group, Minnesota’s food distribution center for the state’s food shelves to feed the hungry. 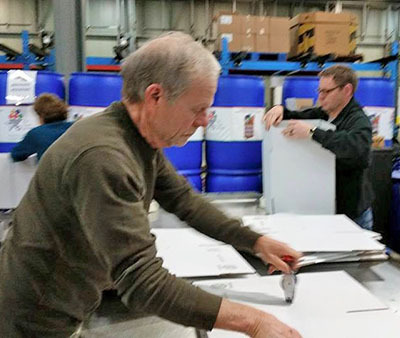 They packed 420 boxes that will feed 1,680 people. Amazing! Sharon packed 5 lb. 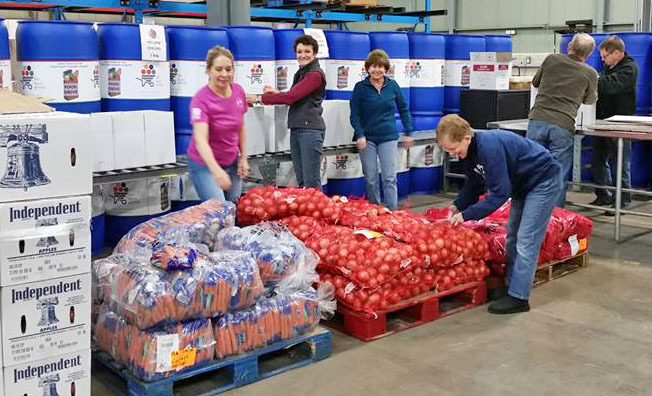 bags of potatoes, Karen packed onions and carrots. Mary packed apples, Ann grapefruit. Barb crushed boxes while the guys taped boxes together. 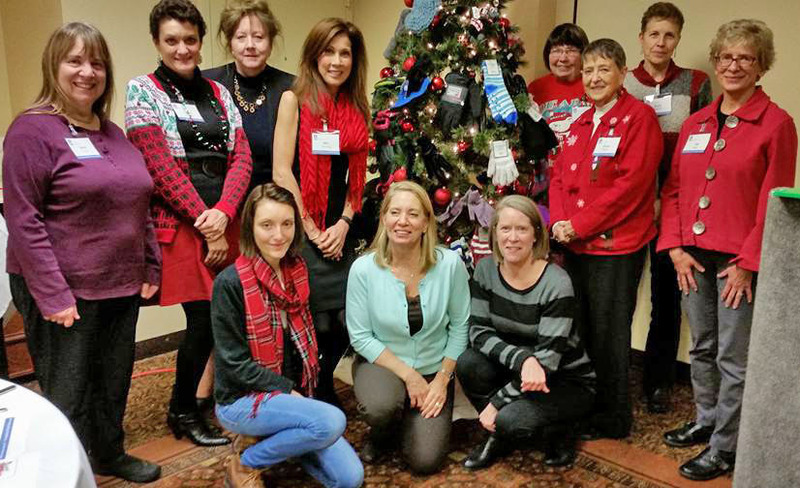 Soroptimist members put their hearts into collecting 5 dozen pairs of mittens and hats to decorate their tree at the annual Holiday Party in December. 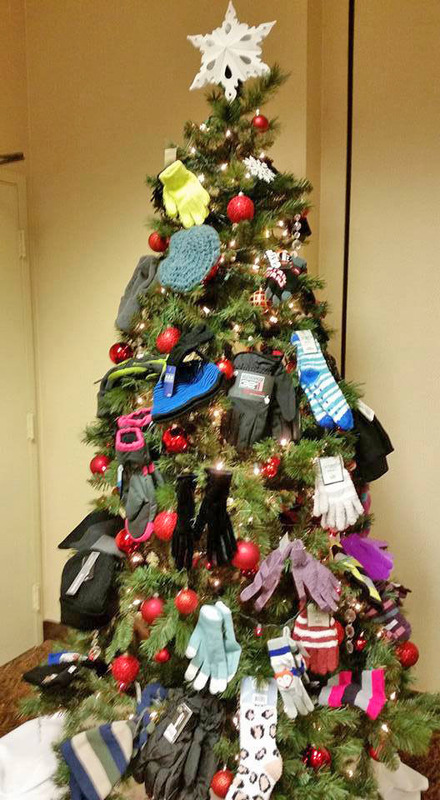 These hats and mittens were later donated to local resource shelters. 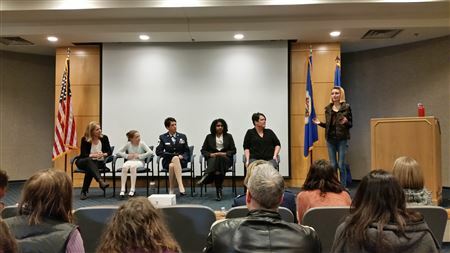 SITC partnered with the Minnesota Air National Guard to host a movie and panel discussion on November 7th. We had 60+ attendees (women, men, girls and boys) participate in this inspirational event to continue efforts to raise awareness of issues facing women and girls. The movie highlighted the stories of nine girls and the obstacles they faced in order to get an education. 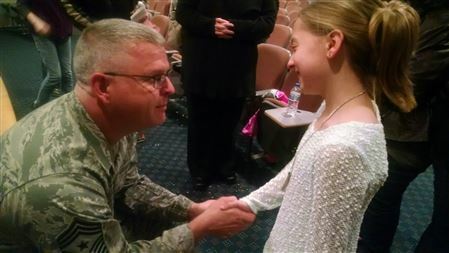 Before the movie, Laura Jeffrey the Air National Guard gave tours of the C130-H planes, which are used to transport our troops and their equipment. Following the movie, we had a panel discussion led by Joanne Johnson. On the panel were CMSgt Kristin Von Eschen/UniteWomen.org, Tiffini Flynn Forslund and Allison Stapley from the Laura Jeffrey Academy, as well as our own Mary Cocchiarella and her niece Eliana Renee Cocchiarella. We had a great discussion about the barriers women and girls face.